Well. . .At least I shouldn't get any DNMC comments with this one, right? :) That beautiful white baby flat out read my mind that I needed a wing photo, took a bow and posed it for me. How could I NOT go with this one after that kind gesture :) And I hope it does well because I love it so much. Sandy, you are THE BOMB! Beautiful shot. I was traveling the week this came out and did not see it until now. What a terrific photo! (I've never seen anyone score only 5 and higher. Even the trolls liked this one.) Congratulations. I like editing, but I also admire good photos without much editing, very nice! Sandy, congratulations, this is simply stunning. So happy to see you with this well deserved blue. Beautiful work from you as usual! Congrats, Sandy. This is a wonderful image. I so glad it got the blue ribbon! Congrats on your blue ribbon, beautiful shot. Gorgeaous shot, congrats on your well deserved blue ribbon! Many Many Congrats!! Simply outstanding.. A moment of triumph w many more coming.. Impeccable!! You are one of my favs not only related to your expertise in photography but related to your redeeming qualities of kindness, caring, and compassion..
Apart from being an absolutely superb shot technically it fits the challenge imaginatively (and even humurously) - not just 'qualifying' on account that there's a wing in the picture somewhere the bird is looking at its wing and inspecting it. The wing IS the subject. A deserved first place indeed, and one amongst a very high standard of entries too. YOU ROCK, my favorite photographer....you just rock! Sandy, way to go! Congrats on your first blue!! Just a great capture, timed perfectly. Congrats...nice picture always love to see someone excited about something they have acomplished...you deserve the blue ribbon. Congradulations Sandy! This was a very fortuitous capture and a beautifully done one as well. Congrats, Sandy! Lowest vote is a 5? Incredible!! So proud of you here in Canada Sandy, WAY TO GO!!!!!!!!!!!!!!!!!!!!!!!!!! Fantastic shot and title!!!!! So pleasant to come back to see this Sandy :o) Congrats, beautiful picture. Congrats Sandy, great job keeping the whites with such a dark background, tricky exposure and processing I'm sure. I had this one in my top 3 for sure. Sandy, I already said how wonderful I think this photo is -- way back at the beginning of voting. Now I want to add my congratulations to this incredible list of well-wishers. I'm so happy you won the blue ribbon. The first of many I am sure. Excellent!!! Congrats on a well deserved Blue!!! congratulations , Sandy- I gave this a ten and then thought- that's got to be Sandy's ! You deserve it totally !!!! Very nice Sandy...congratulations on winning the blue ribbon! Wow your are in form! Congratulations, its a wonderful image. A very inventive image...so well done. Congratulations on the blue. Congrats on the blue Sandy, well deserved I might say. Beautifully pure whites. Congrats on the blue! This shot is absolutely beautiful, congrats on the ribbon!! White Knight bowing to a lovely lady! amazing capture, detail on a white subject stunning! Congrats on your very deserved BLUE ribbon! Wow! Congrats Sandy! It's a super shot and your score is incredible! I don't think I've ever seen an image where not one person voted a 1....or a 2...or a 3....or even a 4!!!!!!!! All 5's and up. WOW! Great job! Congrats on your first blue ribbon, Sandy!! Very well deserved! Sandy, congratulations on your blue ribbon!! Awesome shot!! Congratulations! Wow--no scores below 5! What a great shot! Oh NO "A Kiss for 10 Toes" was bumped off your profile page! I mean sure this is an awesome photo and congrats on the blue, but those 10 toes! Wow sandy! Congrats on your very deserved BLUE ribbon! Awesome shot! Congrats on your first blue, what a beautiful picture! Clean and elegant. Impressive as usual Sandy, so I am not surprised. Only surprising thing is that this is your first blue. Anyway, congrats! I can't believe what a great shot this is. You are sooo talented. Really love it. Congratulations. I had a feeling this was yours when I saw it in voting....congratulations!!!!! This is a wonderfully elegant photo. Love how well the title works with this blue ribbon shot. Very appropriate. Congratulations on an outstanding BLUE. Woooo Hoooo!!! Beautiful, beautiful, beautiful!!! Besides being perfect for the challenge, the lighting and detail are perfect. eta....Not only did you win the challenge with no 1-4 scores, you got a Posthumous 10, too. It's like pitching a no hitter! Message edited by author 2007-08-27 10:53:24. Wow! Congratulations Sandy! This is an incredible shot! You are an amazing photographer! Awesome image Sandy. Well deserved!!! Congrats on your first Blue!!! what a beautiful image. Ribbon couldn't have gone to a more talented photographer...congrats Sandy :-) well deserved! Congrats, Sandy! What a beautiful bird and a beautiful photo. Blue ribbon - YIPPEE! Congratulations on a beautiful shot. Great job. Sandy, Congratulations on this wonderful image and your ribbion. Sandy!!!! Congratulations on this beautiful shot! A blue! How exciting!!! Ssndy, I was too lazy to vote, otherwise you would've gotten 26 10s! As soon as the page came up and I saw the shot ... I said SANDY. Then I checked the title ... which was great ... and the author and confirmed that my first impression was right ... it was my buddy Sandy! CONGRATS, WELL DONE! Beautiful image, congratulations on the Blue Ribbon. Well done Sandy, a truly deserving winner for a beautiful shot. Sandy...you are on a roll girl....; ) simply incredible shot, CONGRATS!! Woohoo!! You're on a roll, Sandy. Congrats on your first blue! Big Congratulations on a well deserved Blue!! Fantastic!!! Sandy You Rock! Awesome job Sandy!!! LOVE IT! Congratulations on your blue ribbon! Well done Sandy. This is an outstanding effort and a ribbon well deserved. What a pose! Congratulations, great photo. I'm very happy for you , the photo is superb ! Magnificent shot! It's beauty, elegance and sophistication. Congrats on the blue! Sand, I am delighted for you - you deserve a blue ribbon with this stunning, well captured moment! Great job. Wonderful Sandy, great shot, congrats on your well deserved blue ribbon. This has imagination, class and beauty. Well done and congrats. One of the 10 is mine. I am gald you got your first blue. Congrats Sandy. You were destined to get a Blue any time and here it is. Well done. Very Nice. Congratulations on a Blue. I didn't get all the way through this challenge and missed voting on your entry. Again congrats! Congrats on the blue, Sandy! Beautiful shot and a well deserved Ribbon. Well deserved blue, great picture. Whoooohooo, Sandy!!! Congratulations on the blue ... wow, it is about time :-) This is a wonderful picture. I'm so happy to see you in first place! Congrats, Sandy - it's a very SandyP image and the blue goes nicely with all the rest of your ribbons! What an awesome result to follow last week, With an image as good as this one BLUE is the only color.....Congratulations. Congratulations to a wonderful lady on a long overdue blue! Spectacular image!!! You even wowed the trolls! NO votes lower than 5!!!! OMG! look at you go girl! they are gonna have to invent new better than blue ribbons so you can keep out doing yourself! this shot is BEAUTIFUL! lovely detail & color... and that pose! congrats to you, love! Thank YOU, thank YOU very much. Ditto everyone and all the 10 votes. 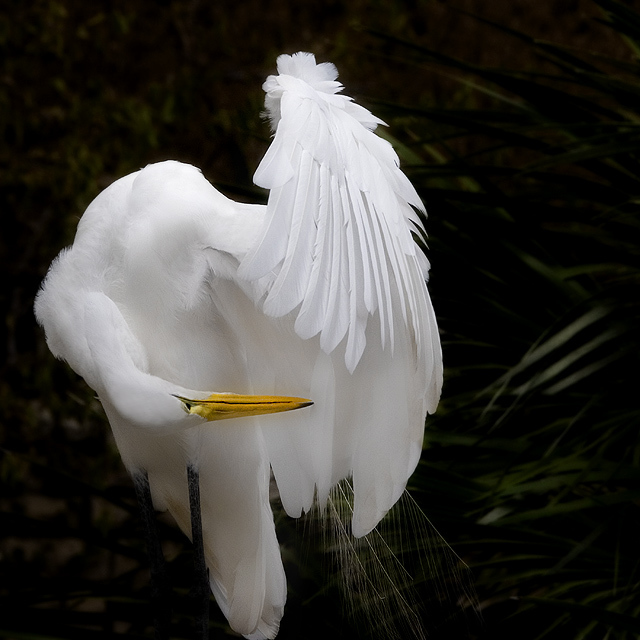 The unbearably exquisite whiteness of the bird and bow. beautiful, perfect for the challenge. Lovely shot Sandy! Congratulations on this capture of such an interesting moment, and of course, congratulations on the Blue! Sandy so very much earned and WOW!! no votes less than 5, that in it's self must be a record for DPC. Perfect subject but yet a much better artist, well done! Nice work Sandy. Well done!! Sandy.... Many many congratulations on your LONG OVERDUE blue ribbon for this amazing work. You, my dear, are on a SUPER DUPER ROLL!!! may it continue forever. Message edited by author 2007-08-27 00:58:04. Congrats on the blue. Fantastic image once again. Oh WOW Sandy!!! Congratulations in winning first place!! I'm so happy for you. You are so deserving of this honor. WOW! Sandy, you're definitely on a roll! This is gorgeous, a truly beautiful capture. WTG, Girl and congratulations on your well deserved blue. Sandy, congratulations on your blue! You're on a roll! A very deserving image, and even more so the photographer! Big congrats to you. Congrats Sandy. You are cleaning house! Wow not a single vote below 5. I didn't vote in this challenge, but I knew this would win as I was flipping through. Really nice, great job. Sandy :-))))) Truly well-deserved win on this gorgeous shot! Stunning image Sandy!! Heartfelt congrats on your blue!! WOW! Congrats Sandy!!! Look at that... not a single vote below 5! Good job! OMG SANDY!! WOOHOO!! GIRL, YOU ARE TOTALLY BACK!! Sandy, What a wonderful photo and my favorite of the Wings. Congrats on your first BLUE. You're on on a streak. Message edited by author 2007-08-27 00:11:20. Indeed you are very welcome and big congrats on your getting that blue you needed, Sandy! Hurray!!!! Wonderful Sandy, congratulations on the blue! GOOD LORD WOMAN! you are really on a roll! YOU GO GIRL! Yippee, go Sandy, two on the front page! And nothing under 5, what a rarity! Nice sharp focus and the white is perfect. Back for another bump. Nicel done and such gorgeous light. Wow, what a pose! Love the lighting. You couldn't have found a scene more suitable if you had set it up! Love this image!! Wonderful detail and lighting. Beautiful shot & clever title! Really nice detail. Great photo, Nice a crisp with nice contrast. Pretty shot. The white color of the bird is amazing! Nie work. what a wonderful, beautiful shape he makes. Very striking. I'm sure this one will be at the top- if not win. Gorgeous and elegant. Very well done. Very graceful. Well done on the exposure. Grace, beauty, and also a cute title. 10. A stunning Photo! I'll be anxious to see how you got the swan in this position. The light and composition are perfect. These are such magnificent creatures. You captured him beautifully. Not sure about the title, but a great shot. heh! vurrrry cute :) nice timing! Proudly hosted by Sargasso Networks. Current Server Time: 04/19/2019 07:03:49 AM EDT.